So now I had my lathe all ready to run. I had installed a 240 volt 16A mains supply into my workshop, fed from the main consumer unit in my house to a standard IP44 CEE 16A blue socket. This was needed as the M250 manual quoted a maximum start up current of 15A. 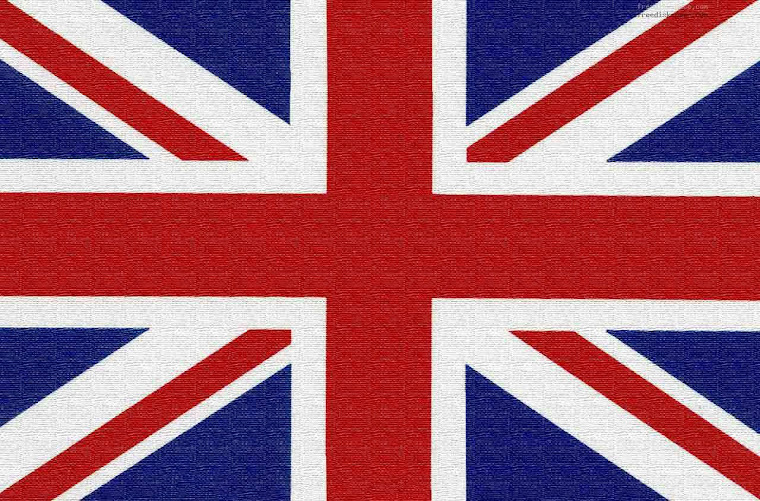 The standard UK ring main is only rated for 13A. I removed the control panel from the lathe and gave it a quick dose of looking at. Whilst somewhat untidy, it was nevertheless safe. I made a mental note to rewire the panel; it would be fine for an initial test though. I connected a length of blue 2.5mm square "arctic" flex to the appropriate point and terminated this with a blue plug. This flex is designed for outdoor use and can carry 25A maximum. I replaced the panel and plugged in. Here you can see the panel as found with my addition of the arctic flex. Sharped eyed readers will notice a component missing. When I plugged in the lathe, the lamp worked and the coolant pump motor ran, but the main motor did not. I checked to make sure that all of the interlock microswitches were in the correct state. Still nothing. 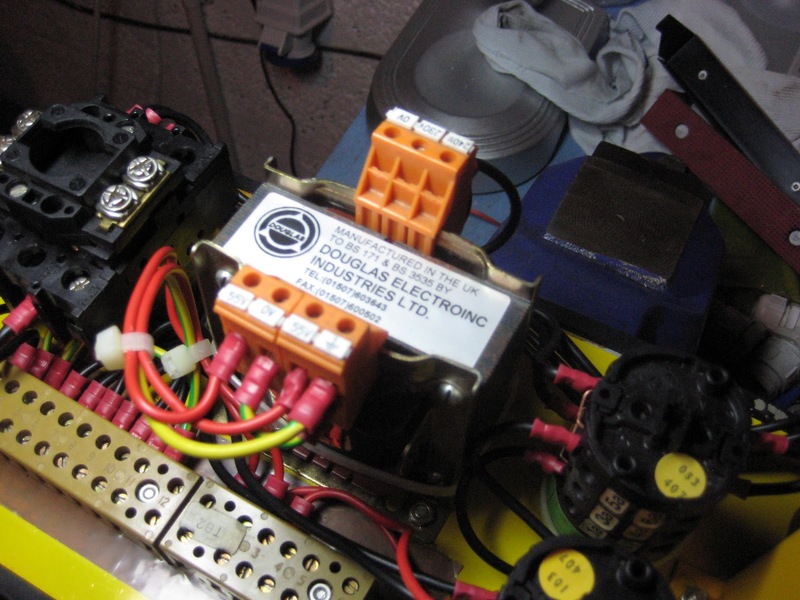 Now, despite the main and coolant motors being 240 volts, the microswitches and control relays are all 110 volts. This is common industrial practice. Microswitches are not double insulated and as there is more chance of the operator coming into contact with them they are fed from a 110 volt supply. This has its centre tapping earthed to the machine frame. That way the maximum voltage the operator will see, between the frame and a conductor, is 55 volts. I discovered that this 110 volt supply was absent. 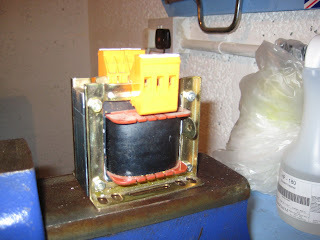 I suspected the supply transformer and sure enough its primary turned out to be open circuit. Hence the gap above - I took the photo after removing the offending item. 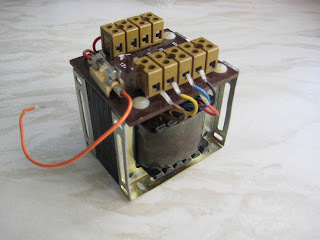 Here is the original transformer. As can be seen, Harrison had every eventuality covered, despite this machine being a 240 volt variant. They clearly just used one transformer type throughout. 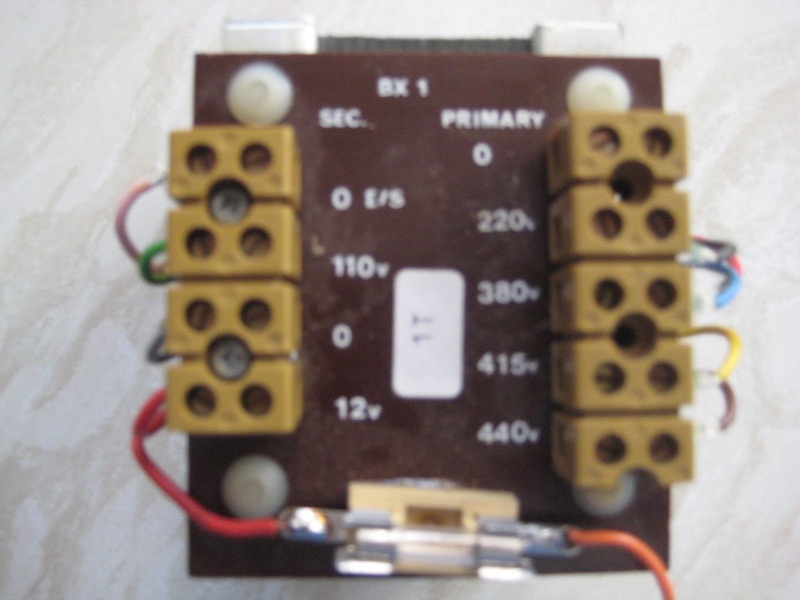 The primary has tappings for 380 and 440 volts, voltages normally found in ship systems. I knew that Harrison supplied to HM Forces, and later discovered the M250 was common on Royal Navy vessels. 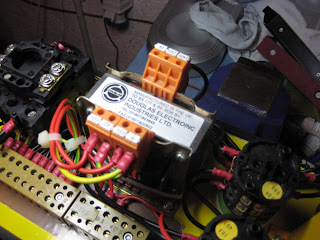 The 12 volt secondary was unused. I now had to find a replacement transformer of the same rating and form factor. Obviously a direct equivalent wasn't a problem; I didn't need all the tappings for the different mains inputs, nor did I need a 12 volt secondary. The trusty manual showed the original transformer was 50VA rating and manufactured by Romarsh. Enquiries quickly revealed that this was an obsolete product. I suppose if I had wanted to be a purist I could have had one made, but I just wanted to get the machine working. The part number was GST50 240/110. The secondary was centre tapped and the dimensions fit the bill. I called them and they told me to send them a cheque and the transformer would be in the post that day. Perfect! If you are reading this and you have a 3 phase machine, do not despair. A 415 - 110 volt transformer is also available. The secondary wiring would be as described above, with the primary connected across two of the phases. 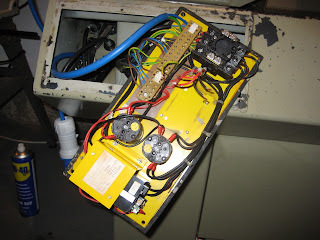 I cleaned and rewired the panel using new equipment cable and fitted the new transformer. Here you can see the finished article. Note the earthed secondary centre tap. The newly spruced up panel was refitted and a successful test of all the machines functions ensued. It was a great moment.